I posted here about writing a letter to the Indiana senators, Richard Lugar and Evan Bayh, about the Coburn anti-pork amendments. Finally this week I heard back from both of them. Senator Lugar sent a form letter, although it was right on topic, and asserted that the "Bridge to Nowhere" was not getting any money, although I haven't verified that yet. A staffer of Senator Bayh's wrote me, though, just saying he received my inquiry and wanted me to call him. Huh! I'll have to do that and see what he has to say. Judge John Jones determined in the Dover, PA court case that Intelligent Design should not be taught as a reasonable scientific alternative to evolution. Well done! But the judge went beyond that, finding that ID is not good science, that the yahoos who brought the case were wasting everyone's time, and all in all wrote a decision that I completely agree with in every way. Can we just project him straight to the Supreme Court? Timothy Sandefur posts a succinct summary of the decision over at the Panda's Thumb. Congratulations to all involved! Jigsaw. Got a new jigsaw puzzle (1000 pieces ) and my four-year-old and I started to work on it. Haven't looked at it since the Sudoku though! LibraryThing. A fun site that lets you catalog and tag books. You're only allowed 100 200 free entries, but the $25 lifetime fee is pretty enticing. I can just see it becoming so popular that even the lifers have to pay extra for new features, though. Yahoo Answers. An evil combination of points, social software, trivia and opinion that I can't resist coming back to several times a day to check on the new questions. Haven't gotten any hugely new useful information out of it, but I bet I get to level 2 soon. Ars Indiana. Don't know if this will go anywhere, but it's my new blog where I intend to put all my cultural-type posts. Put one up on the B.B. King concert last week. Update: It's 200 books, not 100. Sorry, Tim! Thanks to the Panda's Thumb for referencing the Fordham State of Science report. In it, Indiana receives an A and an overall rating of 91%, fifth in the nation. That is an amazing achievement, especially considering how close the forces of darkness are. Nice job, Hoosiers! Wocka wocka wocka. 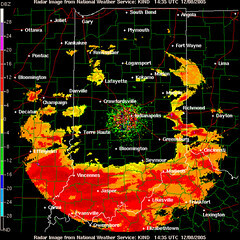 Looks like Bloomington is about to be eaten by Pac-Man.